A classic pair of Claddagh earrings. These beautiful earrings are cast in sterling silver and feature a classic Claddagh design. Stud style with butterfly closure. The hands hold the heart and it is crowned with loyalty. These beautiful earrings are the perfect gift for anyone you love. 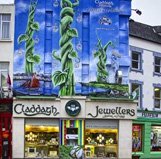 Claddagh Jewellers -The Celtic Jewellery Specialists.